All great characters are made even greater by the adventures they undertake, and yours is no exception! 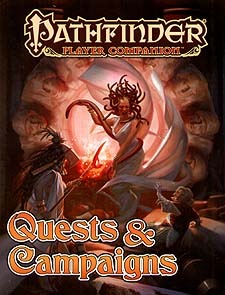 Pathfinder Player Companion: Quests & Campaigns takes your adventurer from zero to hero, providing all manner of tools to aid in the creation and development of your character's own legend. From tables to aid in character creation to feats that point your newly forged champion toward even greater power, this volume offers countless sources of inspiration to prepare you for new and amazing adventures. Random character generation tables to help you create an adventurer who's sure to become a legendary figure in Golarion lore! Dozens of new traits to further invest your character in the world of Golarion and make sure that his first adventure isn't his last. New magic items, spells, and feats for characters using the rules from Pathfinder RPG Ultimate Campaign, from arcana that teleports your business to magical swords designed to slay your own treacherous kin.